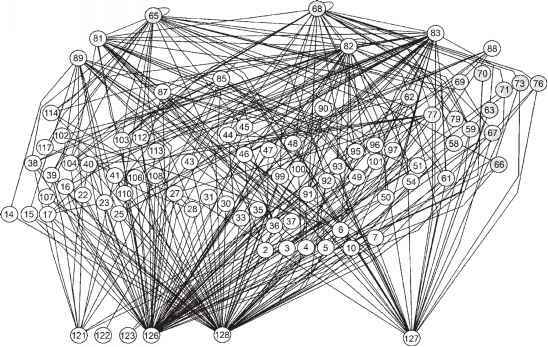 The network of interactions depicted in a food web provides the most complete yet succinct visual summary of a biological community. The study of food webs has a long history in ecology, incorporating at least two major lines of inquiry: one emphasizing how species are inextricably linked through their interactions with one another, hence focusing on population and community dynamics; the other concerned with the flux of organic matter and energy. Most examples can be categorized very roughly as connectance food webs, which attempt to identify all possible linkages; energy flux food webs, which quantify organic matter flow along a limited number of major pathways; and trophic-interaction food webs, which emphasize population processes and species interactions. As the field continues to mature we should expect to see increasing effort to merge the patterns depicted in food web structure with the processes of energy flow and species interactions. changes in species richness, resulting in temporal changes in the proportion of species at the top and the base of the food web. 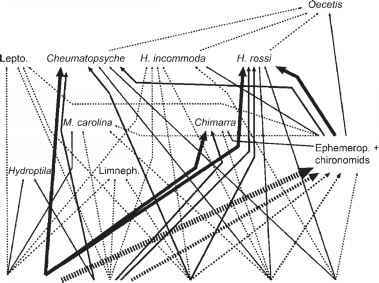 Despite its complexity, relatively simple patterns in food web structure could be found in relation to body size. Meiofaunal and macrofaunal subwebs were effectively two compartments because large prey were invulnerable to small predators and large predators were not effective in consuming very small prey (Woodward et al. 2005). and largest flows were associated with detriti-vores due to their low assimilation efficiency. In the litter exclusion stream, flows to predators were reduced, a few pathways dominated, and consumption rates per biomass were higher, indicating strong interactions with the remaining common taxa. 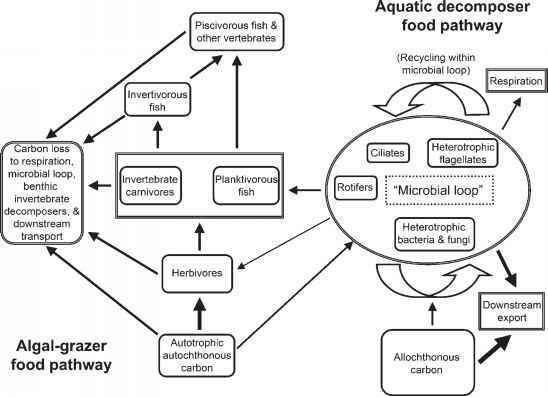 Although gut content analysis remains a widely used approach to the estimation of energy fluxes, despite the difficulty of identifying bits of soft-bodied prey and amorphous detritus, analysis of the natural abundance of stable isotopes in basal resources and in consumers is providing important new insights into energy flows and trophic position (Peterson and Fry 1987). The ratio of the naturally occurring 13C isotope of C relative to the more abundant 12C, expressed as S13C, is a useful diet tracer because C is the main elemental component of organic matter, it passes through food chains with little alteration of its isotopic composition, and S13C values often differ between major groups of primary producers such as benthic algae, macrophytes, and terrestrial plants. In addition, the S13C of consumer tissues directly reflects the mixture of prey resources consumed and assimilated over previous weeks, months, or even years depending on the tissue studied (Finlay 2001). The application of stable isotope methods has led to key insights that would have been difficult to achieve using prior methods. For example, despite the abundance of detritus from macrophytes and floodplain forests in large tropical rivers such as the Amazon and Orinoco, S13C analyses of consumers indicate a minor contribution of this material to animal food webs. Instead, phytoplankton and periphy-ton are the critical energy sources for most fish species (Araujo-Lima et al. 1986, Hamilton et al. 1992).